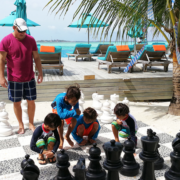 A perfect tropical playground for kids! 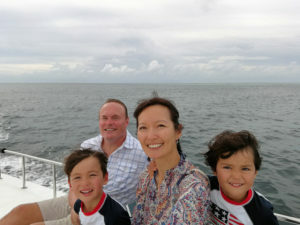 Kids Rating – 7 out of 8 hands, seeing a crown jellyfish up close which was the largest and most colourful they’ve ever seen, watching reef sharks attack and eat a handful of fish, Kiva got to drive a multi-million dollar yacht! 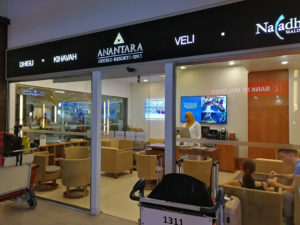 Arrival – upon exiting the Departures Hall there will be a signboard with your name and literally the first thing you see as you make your way through the airport is the Anantara Lounge. 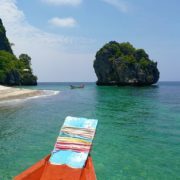 The staff will tag your bags while you sit and relax until your boat transfer is ready for departure or wait for the other guests to arrive. There is a nespresso machine, juices and other drinks available as free wi-fi. Boat Transfer – The hotel sent this little boat to pick us up: the Nirvana, a super-chic Sunseeker Manhattan 53. 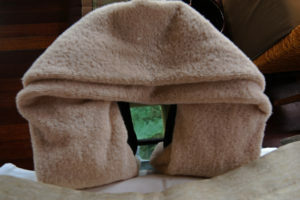 There was plenty of space inside with 2 lounge areas as well as outdoor seating. Since it was raining lightly we chose to sit indoors. They had a lovely video of the marine life found at the resort playing on the tv. The little boys got to sit right next to the captain and Kiva got to drive briefly! The boat was so smooth that the transfer seemed to fly by. 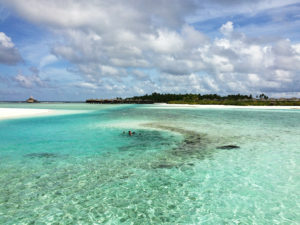 One of the great things about the Anantara Dhigu (and sister resort Veli) is that the islands are only a 40-minute ride from Male airport. 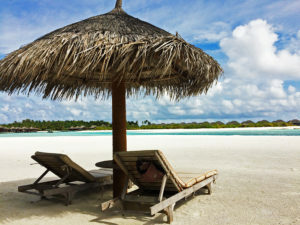 Internal flights are $$$$ and long boat journeys to more remote resorts can be punishing. On the return we took a more modest speedboat back. The boat was very comfortable, covered but with the sides open to enjoy the views. There was plenty of space and Drake took a short nap. 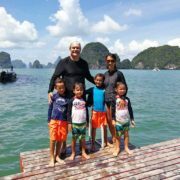 It was a smooth journey and only 10 minutes on slightly choppy water in the open sea which was nothing compared to the ride back from Koh Rong, Cambodia. 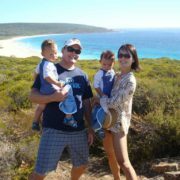 For families with up to 3 children, would suggest a Sunset/Sunrise Beach villa. 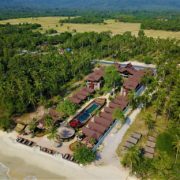 Each villa is 125 sq meters with a king sized bed and a daybed with the option to have 1 single bed ($1​6​0) and a cot (free). While on holidays, each set of twins share one bed either tops & tails or next to each other if it’s a super single. The villas have a lovely balcony, with an outdoor table + 2 chairs and an outdoor daybed. 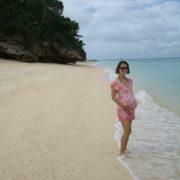 They’re situated just steps away from a gorgeous beach. 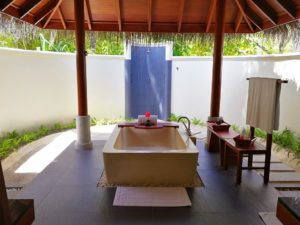 Each villa has a spacious outdoor bathroom with a large sunken bathtub where all 4 of boys could use at the same time! 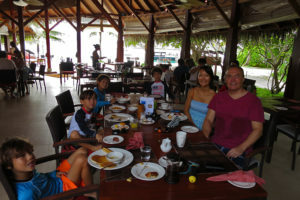 The over-water villas are lovely but not practical if you have young kids. There danger factor is high if your kids aren’t confident swimmers and you have rays and sharks that swim under the villas at times. Each room comes with ample storage space, life vests for each family member, insect repellent, robes for adults and kids and free toothpaste & toothbrush for kids. 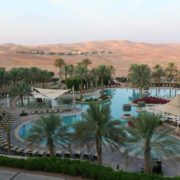 The Sunset Villas are about US$50 more although I think the difference is probably not worth it as you won’t be spending much time in the villa and if you want to watch the sunset, then head to the pool for sundowners. For bigger families, you’ll need to either book 2 of these villas or splurge on one of three 2 BR/2 BA family villa. These 235 sq meter villas have a large private garden with a hammock and bean bags. The over-water villas are also gorgeous but they are at the far end of the island and you have to constantly battle past couples taking cheesy selfies. 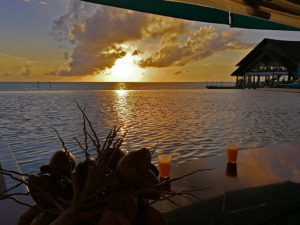 The sunset facing ones have a $65 premium and is worth it if you want to have more privacy as the sunrise ones face the route to Gulifushi so you have pontoons, yachts and even kayakers cruising by your window throughout the day. 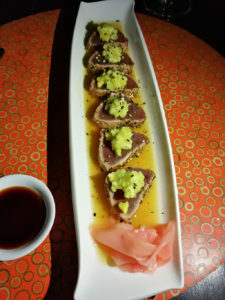 Restaurants in the Maldives are expensive but after living in Hong Kong and Singapore and eaten at fine dining restaurants there as well as in NY, London, Tokyo prices are really not that bad. But how many of these restaurants have ocean views or watch fish swimming in the wild. But a​lcohol is definitely pricey, cheapest bottles of wine are around US100 and a bottle of beer will set you back $15. If you book your stay on the Anantara website they currently have a promotion of complimentary dinner for 2 people. 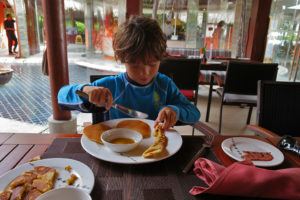 Kids under 12 also eat free (breakfast and dinner) at selected restaurants with kids menus. Aqua – The boys had all their dinners here as it’s perfectly located next to the pool. There was plenty of choices on the kids menu (pastas, burgers, chicken nuggets, pizza, fried noodles) for the boys. All the choices included a drink and ice cream. While the kids ate, Scott & I had sundowners. Sea.Fire.Salt – During the day this seaside restaurant is the perfect spot for lunch or an early dinner so you catch the spectacular sunsets. If you choose one of the outdoor tables you can see all sorts of fish swimming just below the deck. Their specialties are fresh seafood and steaks so we chose one of each. Enjoyed the salt selection whereby 1of the staff gave a short description of the 8 salts available from all over the world. I chose the Merlot Salt, Smoked Black Salt from to go with my fish of the day. The snapper was tender and meaty and came on a generous bed of garlic mash. Scott’s tenderloin was flavorful and juicy. 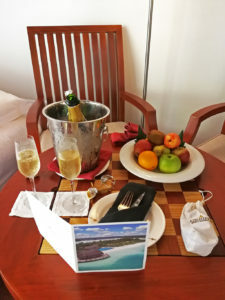 Origami – we took the Pontoon over to the sister hotel, Veli to have a romantic dinner. Kids are only allowed there after 6pm or to dine at their restaurants. On the half board plan, you can choose a starter, main and a dessert. Most dishes are included and there are a few options where you need to top up like the Lobster. The breakfast area had an impressive selection that catered to a diverse clientele. 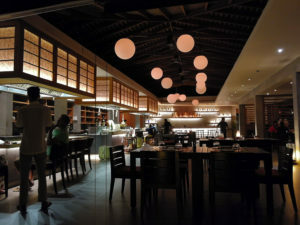 From Middle Eastern, N. African, Chinese, Japanese and European/Western dishes that was spread out between the indoor and outdoor area. There were several Middle Eastern dishes like falafel, hummus, vine leaves and dishes I hadn’t seen in a while like Shakshuka and Foul which are more considered N. African/Egyptain dishes in addition to our usual breakfast mainstays of an eggs and pancake/waffle station, bread/pastries area, salad bar, cheese & cold cut selection, yogurts and fresh fruit. Logan was relieved to see the usual mix of Western cereals available. The outdoor tables were kept cool by a series of fans that were helped along by the seabreeze. . The staff were so lovely and attentive. When the kids were done eating, they searched for crabs on the beach just a few steps away. 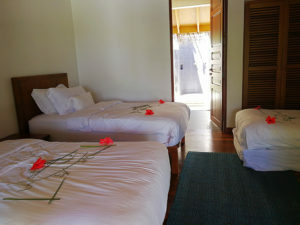 Since most of the single/couples chose the adult only hotel, most of the guests at Dhigu were families. It seemed most of the families had at least 1 young one as I haven’t seen so many strollers in a hotel in a while. But then again maybe they’re more noticeable when parents are seen pushing them across the sandy walkways. 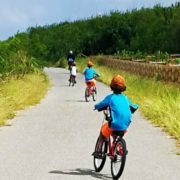 For older kids and adults, the best way to get around the island is by bike. There are free rental bike stations scattered around the island. 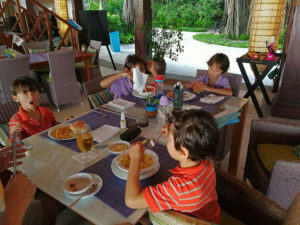 The hotel definitely caters to families with more spacious villas that can fit up to 3 young kids in their villas or up to 5 in their 2 BR family villas. 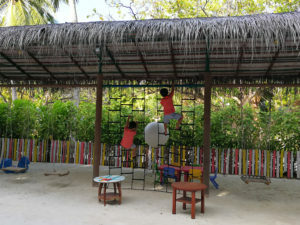 Their kids club had an excellent outdoor sandy area that included a treehouse shaped like a boat, swings and rope-climbing area and an indoor area filled with board-games, soft toys and arts/crafts materials to entertain kids. Open from 10-7pm, they had a list of scheduled activities that changed daily. There was a sandy volleyball court, a ping pong table, outdoor chess set, petanque area where kids & adults could use. There is also a surf school where you can arrange surf lessons/board rentals. The infinity pool was perfectly located, with the beach on one side and on the other side is the Aqua restaurant where they boys had dinner nightly. After dinner they would just jump in the pool while Scott & I finished our sundowners. And to top it off it has a swim-up bar! 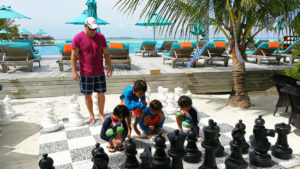 We also loved the life-size chess board where Scott gave the boys an intro to chess which they enjoyed. The hotel has located swings and hammocks in the most picturesque spots. 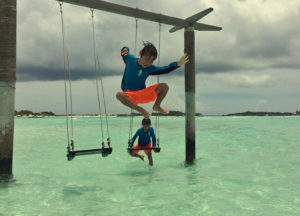 The boys spent almost an hour on the swing at Gulhifushi, taking turns jumping off into the clearest water. We took some lovely shots of them in the hammock set in the middle of the ocean. Due to the strong current, it took Scott four ‘turtle rides’ (hanging on to Daddy’s back) to get them out to this hammock…but it was certainly worth it! In hindsight, we should’ve put them in life jackets. On our first day, we took the boys snorkelling just at the area behind our villa and were wowed by the variety of fish that we saw: parrotfish, Blue Tangs (Dory), butterfly fish, file fish, lots of varieties of wrasses and fusiliers, an enormous unicorn fish and 3 lion fish (only ever seen while diving) hiding under a rock just below the pier. We brought our own snorkels/masks and there were life jackets for all 6 of us in our closets when we checked in but you can borrow all these items free of charge from the Water Sports Centre. 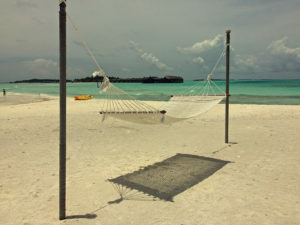 Don’t miss a visit to Gulhifushi a private island owned by the Anantara and is also known as the snorkeling island. 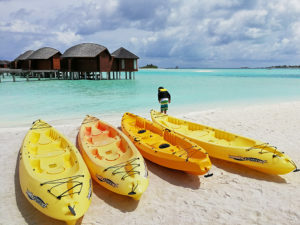 It’s free for guests and just a 5 min pontoon ride from their Dhigu property or you can rent a kayak/SUP which took about 15 mins and stop at 1-2 beautiful sandbars along the way! We saw a fantastic variety of marine life including a school of unicorn fish and tuna, trigger fish, moorish idols, parrotfish, needle fish, angel fish and much more! We even saw 3 reef sharks chasing and then finally eating several fish! Definitely recommend a half day here! Prior to your arrival or on the 1st day of arriving, stop by the Water Sports Centre and find out what activities/excursions are available. 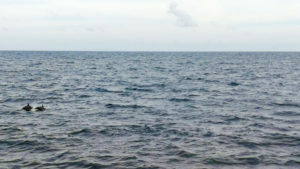 During the rainy season, the availability of the activities are dependent on weather conditions/currents. In addition to getting your snorkel gear, they also have 2-seat kayaks, SUP’s, jet skis and lasers for rent. Also recommend the Anantara Dolphin Cruise while you’re in the Maldives! We saw 30-40 spinner dolphins during our 2 hour cruise. It took about 20-25 mins of cruising before they spotted the pod of dolphins. The cruise costs US$70 p/p which is similar to what a dolphin cruise would cost in Hawaii and about 25% more expensive than what we paid in Muscat. Although we spotted more dolphins in Oman, it was a smaller boat, more of a speedboat than a yacht carry the same number of people. And more importantly, it took over an hour to find them and the seas were much more choppy. The odds of seeing dolphins is closer to 50% in Oman whereas it was more like 80% in the Maldives. 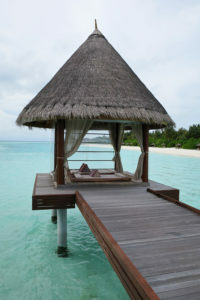 Dhigu’s Spa is stunning! There are 6 x 2 person over water treatment rooms and 2 open-air salas. During the first 2 days of your stay you have a promotional rate of $95 for an hour oil massage. Price is comparable to a 5* hotel in BKK and definitely cheaper than 5* hotels in the US/Europe. But does your treatment room have ocean views and a floor porthole where you can watch fish swimming while being massaged??? You also have access to the relaxation lounge with a hot/cold pool and sauna before/after your treatment! It’s open 10-10pm but book ahead as slots fill up fast. Scott did a full hour oil massage and said it was 1 of the best he’d had. The masseuse didn’t waste any of the movements so each time she pressed it was working a muscle or point of tension so she was very experienced. The service was top notch, consistent with the other 6 Anantara Hotels/Resorts where we’ve stayed! The staff were enthusiast, friendly and always eager to help. 1. 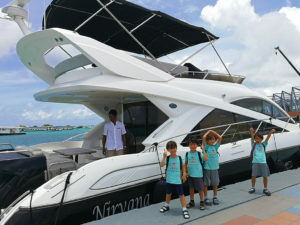 Staff of the Nirvana – best boat crew, knowledgeable about the area and marine life. Special thanks to Jalle for letting Kiva drive the gorgeous yacht! 3. Joy and the rest of the restaurant staff at Fushi Cafe. My waterproof case wasn’t so waterproof after a swim out to the water hammock. Joy and her staff helped me put my phone in a container of rice and returned it the next day in perfect working condition. 4. Prashrit – assistant to the front office manager,, he drove me around in a golf buggy one morning to look for Logan who made his own way to breakfast instead of following the rest of us who walked along the beach. 6. Bhigu, our sommelier at Origami, Anantara Veli. He was very knowledgable about the wine list, helping us to select a wine that went perfectly with our meal. He was also great to chat to about working/living in the Maldives.